6. It’s always good to send a test email on the day the autoresponder is due to start just to double check that you get a response. With your autoresponder now setup and you can go on holiday and rest in the knowledge that if someone emails you they will get all the information that they need. 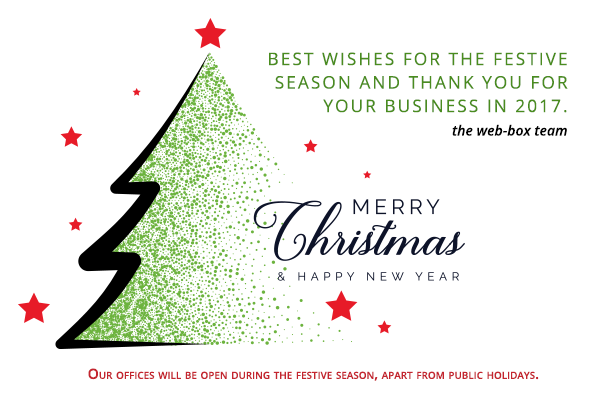 Have a wonderful festive season! Don’t forget: referring a new client to us is a WIN-WIN! We want to remind you of our ongoing refer-a-friend policy. If you send a friend our way and they sign up with web-box, both you and the friend you referred will get a 50% discount off your subscription fees for 3 months. All your friend needs to do, for you both to benefit from this amazing offer is to let us know that you were the one who recommended us. We hope that this perk will help you boldly share your love of web-box! Estate agents, your clients are on Facebook. You should be too. For almost fifteen years, web-box has been a market leader in providing websites to estate agents, exclusively. Over this time, we have gained a lot of experience about the most effective ways of marketing your business and, in particular, how to attract sellers and buyers online. As you know, in the estate agent industry, having a strong online presence is absolutely critical. Most sellers, buyers, landlords and tenants use the internet as their first port of call - and while having your own website is an essential starting point, social media is a powerful and cost-effective way of getting your business and your well-maintained website in front of the right people. Facebook, in particular, is the social media network of choice for estate agents – and with internet users spending more time on Facebook than any other site, it has gone from a ‘nice to have’ to an essential part of marketing your properties. Facebook gives you an opportunity to build your credibility and create brand awareness by providing your followers with interesting and relevant information about your industry, business and local area. It ensures that you are ‘top of mind’ for both sellers (which will increase your mandates) and buyers (which will increase your sales), as well as for landlords and tenants. As with our websites, our exclusive focus on estate agencies means we are able to deliver exceptional value, at the lowest possible prices. Our dedicated social media team’s in-depth understanding of the industry allows them to produce the best possible content to generate client interest and engagement. We are very excited to show you our social media offering and think that you will love the added attention it can bring to your business.The same rules that apply to building a real-life relationship apply to Facebook. The more good interactions you have with your Facebook followers, the stronger that relationship becomes. That said, we know that you, our clients, have a range of budgets, social media skills and marketing needs, so we have developed 3 options to accommodate this, all offering unbeatable value. Click through to our website for the pricing schedule and more info. There has been a worrying increase in fraudsters posing as known clients or regular service providers in various property transactions and, as you can imagine, the losses can be substantial. This email fraud takes many forms but one of the the most common and easily overlooked is when you (or a client) receive an email that looks exactly like it comes from a known party in one of your deals, whether buyer, seller or conveyancing attorneys, requesting payment to a specific account or “confirming” bank details for the payment. This is called spoofing, and unfortunately, it is actually pretty easy to do: displaying a name in the sender line that is different to the actual address is not hard if you know a little about it. Following the instructions in this email will result in you paying the fraudsters directly into their bank account. Bye-bye funds! A while back fraudsters did this with an email account belonging to one of SA’s leading estate agents. Despite appearing to have been sent from the agent’s official Seeff address, it was fake and contained bank details of the fraudster, not the appointed conveyancer. This resulted in the buyer being defrauded by close to R1m. So, what’s the bottom line? Do not let your guard down. Rather start from the assumption that any email in your inbox regarding payments could be a targeted attack from a criminal. These situations can be well managed simply by having protocols in place in your office (and for your clients) for whenever bank details are involved or money is transferred to a new beneficiary. We strongly recommend putting these protocol into place immediately! Immediately prior to paying any money, ensure that the payer calls the recipient to verify the details. Trust your instincts. Tell everyone involved that if an e-mail or a telephone call ever seems suspicious or not quite right, that they should stop until the communication has been independently verified. Clean out your e-mail account on a regular basis. Your e-mails may establish patterns in your business practice over time that fraudsters can use against you. Change your email usernames and passwords on a regular basis. Please be aware that these emails can be extremely convincing. Many intelligent, well informed people have been duped. No one should assume that they are “too savvy” and no one should assume that they are “too small a target” to be defrauded. Why not talk it through as key role players in your agency and ask yourselves what you can do to foolproof your system? This information is very important. For some it will be a useful reminder and for some it will be the first time you have thought to double check. Either way, we hope that you will make sure the people responsible for making payments in your transactions are 100% sure the instruction is legitimate each time. Please don’t hesitate to contact us if we can help you with any of this. New Free Property Portal Feed! As you know, we’re always looking to partner with reputable and well-managed property portals to give your properties optimal exposure. It is not always easy to find portals that we believe will add real value to your website, so it’s very exciting when we can introduce you to a new one. Meet immoafrica…. The immoafrica website is well designed and easy to navigate. They cater for sales and rentals of both residential and commercial properties. Your listings are automatically fed through to immoafrica from your web-box website - no need for you to do anything extra. In your web-box Admin Console you’ll now see the new link (next to each property) to view that property on the immoafrica website. We think that you’ll get great benefit from this bonus feature. Please don’t hesitate to contact us if you need us.